Welcome To Leawood, Kansas, please explore our website to learn about our organization. Gayle Johnson, Parliamentarian; Sandy Berland, Advisor; Debbie Scrivner, Membership VP; Judy Kostusik, Treasurer; Pegge Hudgins, Secretary; Charlene Nye, 1st VP; Viola Dreyer, President. Join us and get acquainted with your Leawood neighbors. The Leawood Welcomers has been a social organization since 1958. 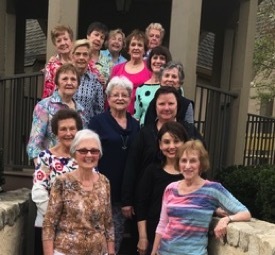 Our members work to improve and enrich the lives of the women in the Leawood area through activity groups, luncheons, club parties and a variety of club functions. 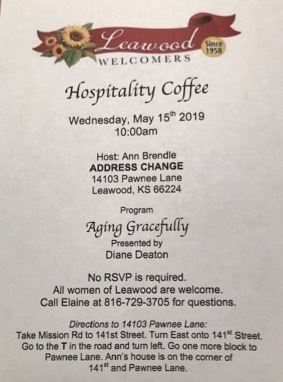 If you are interested in opportunities, making new friends and want to have lots of fun and laughter, the Leawood Welcomers is the club for you. Please contact any of our Officers for more information about any activities that may interest you.